Spinal muscular atrophy (SMA) is an autosomal recessive, hereditary disease with a reported prevalence of 1 in 11,000 live births. As the disease affects motor neurons, the clinical manifestations relate to muscular weakness and atrophy. The specific clinical course varies depending on the patient and the subtype of SMA. Little has been published on the urological manifestations of SMA. For instance, though kidney stones are relatively common, occurring in 1 in 11 persons in the United States , the occurrence of kidney stones in SMA has not been covered in the medical literature. Nonetheless, it is important that clinicians are aware of the unique challenges that managing kidney stones in SMA patients present. While the general principles of managing kidney stones apply to patients with SMA, clinicians should also consider details specific to SMA patients when deciding how best to manage kidney stones in this population. In cases of surgical management of stones, there are no specific contraindications. However, a careful pre-operative evaluation should be completed prior to any surgical intervention and should involve a collaborative effort between the urologist, anesthesiologist and pulmonologist. The primary consideration in SMA patients should be risk of respiratory complications associated with anesthesia. Though neuromuscular blockers have been used in patients with SMA, these patients may have increased sensitivity to these blockers. Because there are no reported outcomes for stone surgery in the SMA population, the choice of which surgery to perform should be based on stone and patient characteristics. For patients in whom a percutaneous nephrolithotomy (PNL) is believed to be the best option, one should be particularly cautious and avoid supracostal punctures due to the increased risk of pleural complications. Depending on the patient habitus and the surgeon’s experience, a supine position may be preferable for PNL. Additionally, a staged approach with ureteroscopy and laser lithotripsy should be considered. Given the potential increased risks of anesthesia in those with SMA, SMA patients with kidney stones should be strongly encouraged to undergo metabolic evaluation. This approach is consistent with the American Urological Association Guidelines’ recommendation to assess “high risk” patients with a comprehensive evaluation. 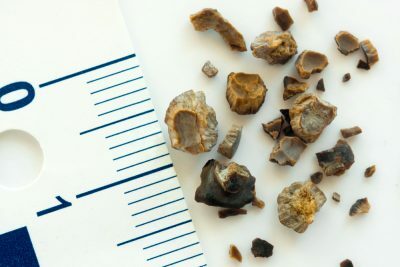 Because there are no reports on specific risk factors for kidney stones in patients with SMA, it is important to collect 24 hour urine samples to determine underlying risk factors for stone formation. Basic blood chemistry, stone analysis (if available), and urinalysis +/- urine culture should all be incorporated into the evaluation. As the risks associated with surgical intervention in this population are likely enhanced, aggressive prevention is preferable. 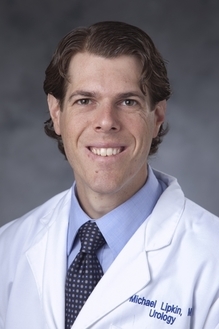 As such, physicians should provide dietary guidelines for prevention, which include the need to consume 2 to 3 liters of fluid a day, maintain moderate calcium intake, and minimize sodium consumption Findings from the 24 hour urine collections may also allow for more specific recommendations. In addition to diet, strong consideration should be given to directed medical therapy for stone prevention. Once on directed therapy, patients should be monitored with repeat 24 hour urine collections to ensure appropriate response. Periodic imaging should be performed to monitor for stone growth and new stone formation. Though there are not a lot of recommendations or reports focused on patients with SMA and kidney stones, the approach for managing stones in this set of patients should generally be analogous to managing stones in other patients. However, in patients with SMA, emphasis should be placed on considering anesthetic risks when planning for procedures, initiating prevention and monitoring measures, and ensuring good communication between the urologist, anesthesiologist and any other providers caring for the patient. 1. Kolb, S.J. and J.T. Kissel, Spinal Muscular Atrophy. Neurol Clin, 2015. 33(4): p. 831-46. 2. Scales, C.D., Jr., et al., Prevalence of kidney stones in the United States. Eur Urol, 2012. 62(1): p. 160-5. 3. Islander, G., Anesthesia and spinal muscle atrophy. Paediatr Anaesth, 2013. 23(9): p. 804-16. 4. Assimos, D., et al., Surgical Management of Stones: American Urological Association/Endourological Society Guideline, PART II. J Urol, 2016. 196(4): p. 1161-9. 5. Pearle, M.S., et al., Medical management of kidney stones: AUA guideline. J Urol, 2014. 192(2): p. 316-24. I am focused on the surgical and medical management of kidney stones. I do a large volume of surgeries for kidney stones, however what gives me the most satisfaction in my practice is helping my patients prevent kidney stone recurrence. I work closely with my patients to determine the specific causes for their kidney stones. We review this information and then decide on a preventative plan, which often includes dietary changes and even medications. I find it extremely rewarding to help my patients prevent kidney stones, as many of them are surprised that it is possible to prevent them.